There are currently 32,320 users on this website. 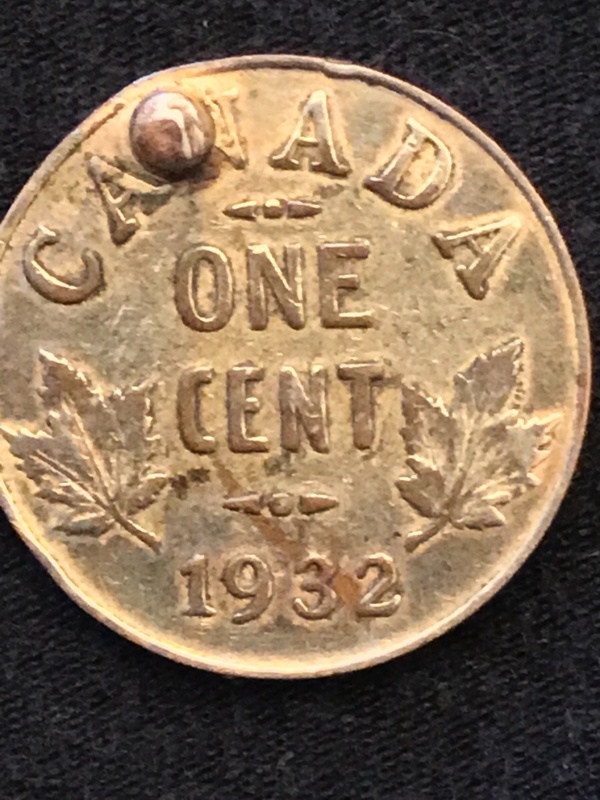 Hi everyone, I need a little help with this 1932 Canadian Penny. Haven't been able to find anything online that is similar, leading me think it's gotta be rare. Looking forward to hearing your thoughts. Thanks! Looks like someone took a round punch to it. That stinks, I had contacted a very well known auction/appraisal service and was told that it was an error but they didn't value it, I still have their email. I thought that the coin was suppose to be copper? 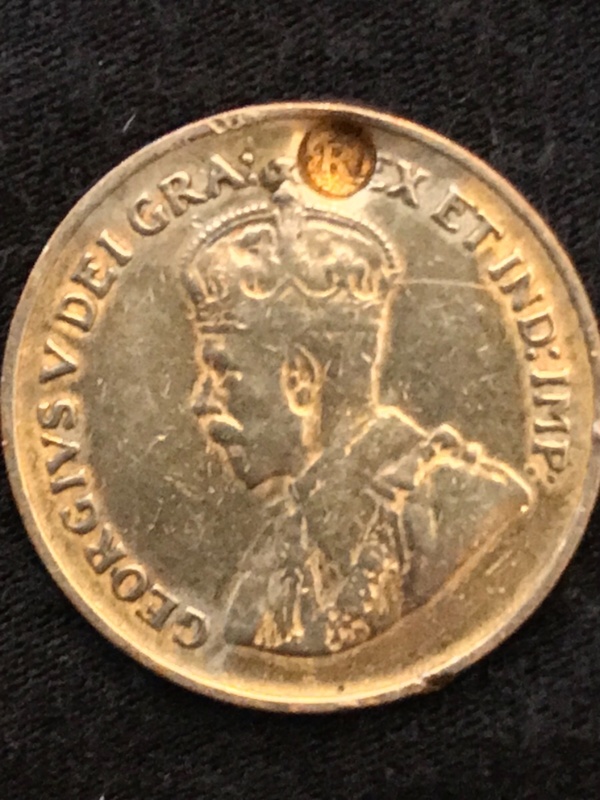 This one is silver in color with a golden hue or tone, the two areas that I notice copper is in the indentation and near the date. I originally thought that as well about the hole punch but it is very clean, I can easily see the "R and part of the "E" in "Rex" , and see the "N" pushed out on the back. Not saying anyone is wrong but would sending it into a grading service give me a definite answer? Guess I got my hopes up when Heritage said it appeared to be authentic. Anyway, all input is appreciated. Thanks guy. Definitely PMD ... and Heritage told you it was a real error? Don't waste your money on a TPG ... it'll be body-bagged. 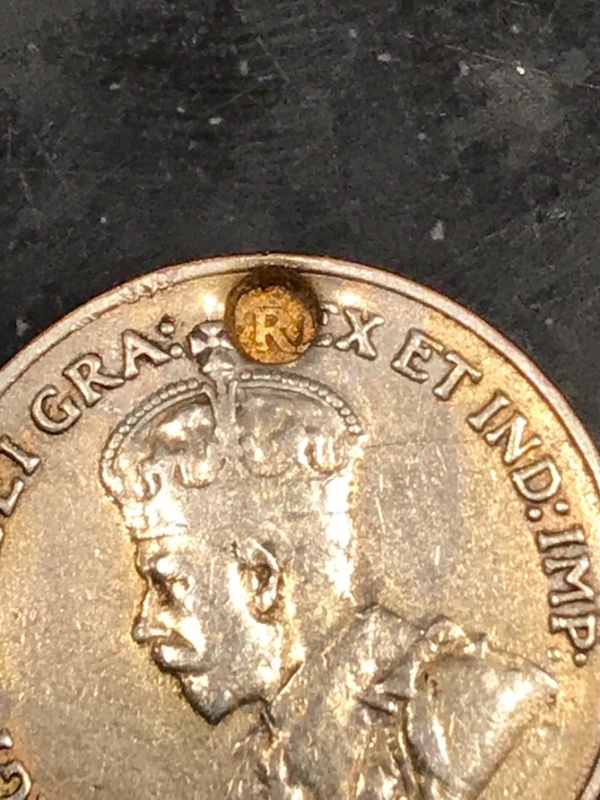 Looks like copper to me (a 1932 penny is 95.5% copper with tin and zinc making up the rest). If there is any silver on the coin, it was likely plated, as it doesn't appear to have been struck on a different (i.e., silver) planchet. Did Heritage explain how you could possibly have a bulge on the reverse if the planchet was struck (sandwiched) between the hammer die and the anvil die at the same time when minted? Hahaha maybe..... anyway, how do I delete the thread? If the coin is of no value I now know what I needed to know. I don't wish to drag Heritage or Cale through the dirt. Not at all; everyone makes mistakes. You should see the number of posts on here about PCGS, ICCS, etc totally mis-grading coins! "Attempted puncture" is not anything like any know/described error type. 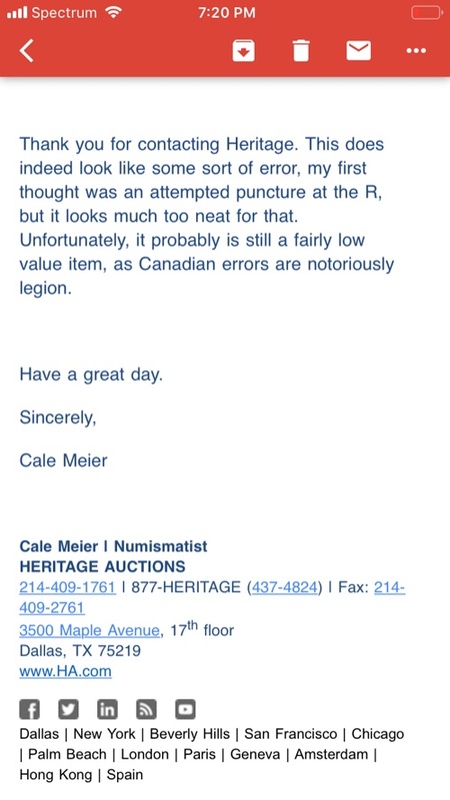 "Canadian errors are notoriously legion" sounds derogatory and is wholly untrue. A minuscule quantity compared to USA error coins.